Developed on the site of our family farm in the heart of the South Hams, Brownscombe is the ultimate destination for luxury glamping in Devon. In the words of one of our guests “the comfiest beds that we have ever slept in, the best views we’ve woken up to and the kindest hosts you could wish for”. 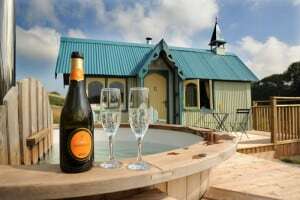 We have a choice of four beautifully kitted out safari tents (this is camping, but not as you know it), or if sleeping under canvas is not your thing, you’ll love our sweet tin tabernacle (perfect for couples) or our secluded wooden cabin – both with rolling views up the valley. 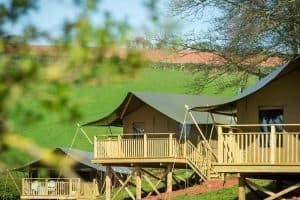 Nestled on the slopes of a two acre field full of buttercups, our luxury canvas lodges are perfect for families and friends and each sleep six. There are four tents, Bovey, Dart, Tamar and Yealm (named after our favourite Devon rivers), each facing in a slightly different direction to make the most of the awesome views. Our sweet tin Tabernacle is utterly endearing with its stained glass window and tiny bell tower. Cosy up with a hot chocolate in the rocking chair by the stove, or relax outside with a glass of bubbly in the wood fired hot tub. The Tabernacle is tucked into a dip on the side of the hill in its own meadow. You’ll feel completely private and at peace, with only birdsong to disturb you. Nestled in its own secluded corner of Brownscombe, our cabin is the perfect secret hideaway. Completely private, it has stunning views up the valley. Sink into luxurious Egyptian cotton bedding, lie back, and watch the wind blow gently over the barley field just metres from your door. 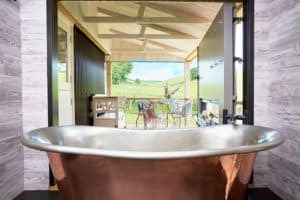 Open the sliding door to the luxurious bathroom and bathe al fresco in the stunning copper bathtub.